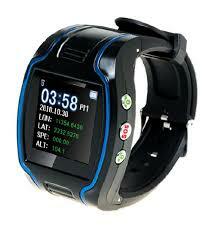 GPS Tracker Watch, as a personal remote positioning device made up of GPS module and GSM / GPRS module, is compact in dimensions with high accuracy. On the basis of GPS satellites and under dynamic conditions, it can provide you with accurate and correct location information. With such features, it can be used to protect and look for our old people and children. It can also be used for safety purpose and other purposes, such as remote positioning to protect property safety. Wear that New Safety Realtime GPS / GSM / GPRS Tracker Watch Style to find and to check remote targets through SMS or even GPRS. This fashionable tracker watch suits all and can make an ideal monitoring tool for many who need continuous monitoring and for individuals who are often involved in outside physical activites or even dangerous workouts. It may protect people out of all walks of existence such as elders, kids, workers, businessmen, sports athletes, and servicemen. Additionally, it features low voltage alert, emergency switch for support, GPRS sightless area compensation, oopen as well as close e-fence feature, and double channel transmitting among others.